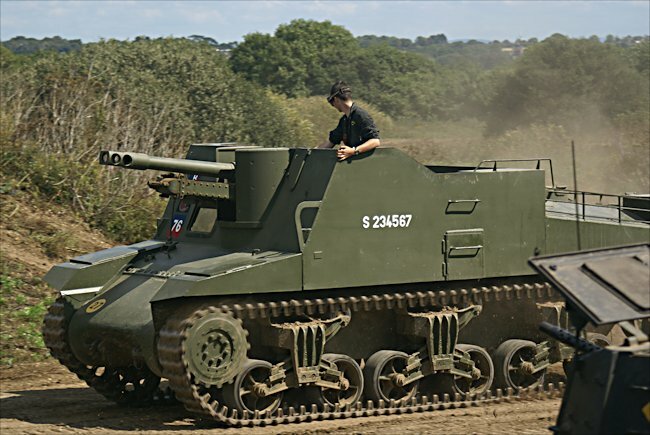 This British WW2 Sexton II Self Propelled Gun SPG is in private ownership but can be seen at many of the military vehicle events during the summer in Britain. It often gave a show at the Isle of Wight Military Museum tank ride field. Unfortunately because of the land owner wanting more money this fantastic small museum had to close in 2013. Most of their tanks went back to their owners or sent to Bovington Tank Museum for future restoration. This Sexton II SPG is one of the later models as it is based on the M4A1 Sherman Grizzly chassis and has an Ordnance QF 25 pounder (87.6 mm) Mk II with 105 rounds mostly HE ,high explosive, carried on board. It had a 4 man crew and they were protected by 65mm of armour plating in the front. They also had use of Two 0.303 (7.7 mm) Bren light machine guns fitted to the top of the crew compartment armour; one in the front and one at the back. It had a top speed of 40 km/h (25mph). War in the North African deserts was very mobile. The British army identified the need for an artillery gun that could be fitted on top of the tank chassis so that it can keep up with the armoured divisions and fire almost immediately. The British QF 25 pounder gun howitzer was chosen to be placed on top of a Valentine tank chassis. It was called the Bishop. It had a number of faults. The protective turret was very tall and therefore the vehicle had a high profile that could be easily spotted by the enemy. It was slow and had problems keeping up with some of the faster tanks. The gun crews had difficulty elevating 25 pounder howitzer to get the most out of its long-range. They had to resort to driving into high ground, so as to position the Bishop as an angle. In the flat deserts North Africa, this was a problem. With the introduction of American 'lend-lease' program, the US built M7 Priest arrived in the desert and quickly replaced British Bishops. It used the M3 tank chassis and the American 105 mm howitzer. It was a good weapon but there was a problem with supplying it with enough ammunition of the right type. American shells were in short supply. The British army needed a self-propelled gun that used the 25 pounder but on a better chassis. The answer was the Canadian built Sexton self-propelled gun. 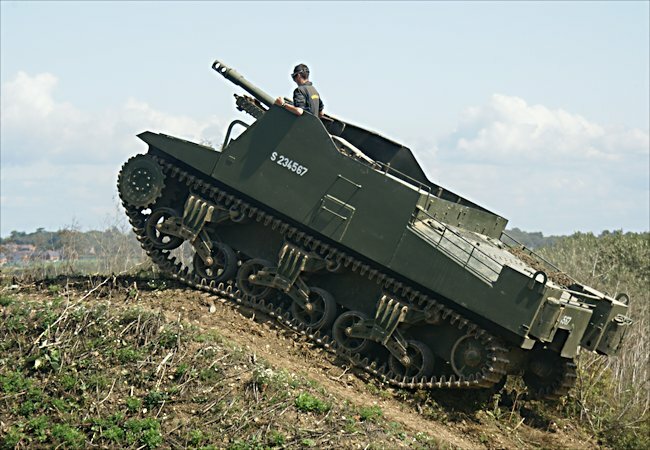 The British government had asked the Canadians to build a vehicle similar to the American priest but based on the Canadian Ram Tank chassis that was already in production and mount 25 pounder gun on top. Sextons that use the Ram chassis were called the Sexton I SPG. Only 125 vehicles were made. Sexton II use the better M4A1 Sherman tank chassis. More than 2000 of these were produced in Canada. Unlike the German self-propelled guns the British never intended the Bishop, the Priest or the Sexton SPG's to be used in a front line direct fire anti-tank role. They were used in the traditional artillery battery formation that supplied indirect supporting fire. They were kept well back from the front line and relied on forward observers to spot targets, observed shell falls and radio back corrections. Some were called on to fire directly at tanks when they got too close but because of their thin armour they had to retreat very quickly. The British Sexton II saw action in North Africa, the invasion of Sicily and the Italian mainland. They were use on D-Day in Normandy and later throughout 1944 to 1945 in Northwest Europe. They were among one of the first armoured vehicles to fire in anger on D-Day. While still in landing craft the gun crews in the Sextons fired their 25 pounder guns at German positions on the beach. The idea seemed a good one at the time but unfortunately the weather conditions on D-Day were far from ideal. The water was very choppy and the landing craft were violently moving up and down. The shells fired from the sextons in the landing crafts was not very accurate and did not do much damage.